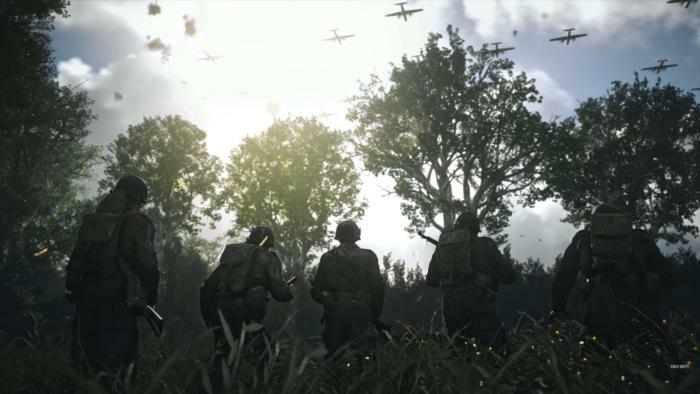 Ten years on from Call of Duty 4: Modern Warfare, the series finally goes back to World War II to tell a Band of Brothers-style tale for a new generation. It’s been a decade since Call of Duty 4: Modern Warfare revolutionized the first-person shooter genre, a decade since Infinity Ward convinced everyone to finally stop making World War II-era shooters and move on to the comparatively greener (or sandier) pastures of modern and near-future war. And after a decade…well, World War II’s started to seem like fertile ground again. And so perhaps it’s fitting that a decade on from Modern Warfare, Sledgehammer is releasing Call of Duty: WWII. This morning’s worldwide reveal was a bit laggy, but the trailer’s below if you missed it or want to see a version that’s not a slideshow. The Normandy landing is right up front, same as it’s been for so many World War II games before. I’ve been waiting to see what Normandy would look like with modern tech though, and it is terrifying. The old Medal of Honor version of Normandy will always hold a place in my heart, but the new Call of Duty: WWII version is grim, at least in this trailer. From the livestream, it looks like the game will then follow a group of soldiers through France and into Belgium and Germany, Band of Brothers style. It’s nothing that we haven’t seen before—at least those of us who were playing video games pre-2007. But with such a lengthy lull in World War II-era games, maybe that’s all Call of Duty needs. Everything old is new again. Then of course you’ve got the multiplayer side of things. Zombies is back, with the livestream teasing a single image of a Nazi zombie. On the competitive front, there are a handful of new modes, including the “War” mode, which sounds like a series of battles a la ”Operations” in Battlefield 1, loosely tied together with bits of narrative. Players will also join Divisions, refreshing Call of Duty’s create-a-class feature with a bit more of a historical framework, though we didn’t see this particular feature in action. Expect more at E3. Anyway, it’s the most interested I’ve been in Call of Duty in quite a while. Hopefully Sledgehammer does Call of Duty 2 proud and makes a properly solemn and respectful World War II game. The series could use a pivot after the past few years of near-future and future-future ambivalence.